Lost in Translation: "The Assassin"
There was a moment during “The Assassin” when I realized I was looking through the wrong cultural lens. 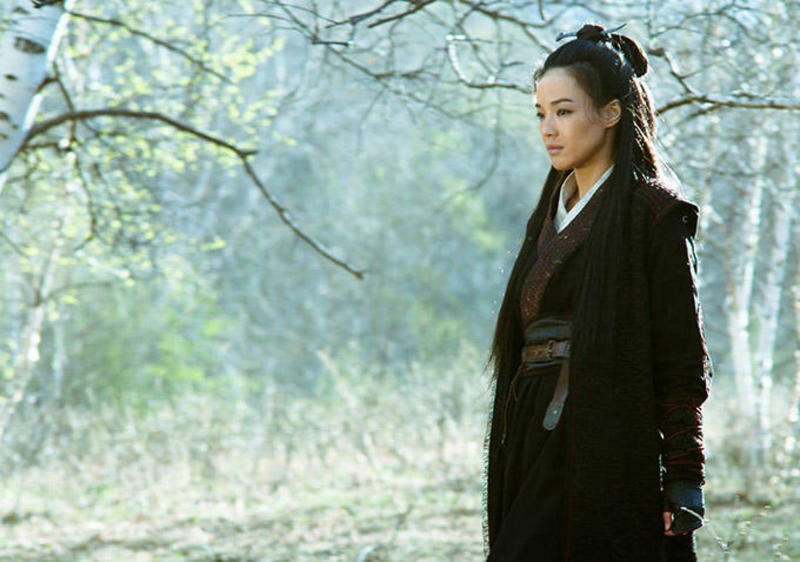 I began to think that these sorts of cultural confusions, things lost and misunderstood in translation, might make the gorgeously picturesque “The Assassin” more confusing for non-Chinese. The moment I am thinking of is early in the film. Two women are seated at a table with red pomegranates on it. Behind them is a screen painting of a pine tree. The season was autumn, (I know from the pomegranates), and I thought of Takasago. Yet China is not Japan, and while they do share some myths and legends such as Tanabata (Weaver and the Herder), Takasago (高砂) is not one of them to my knowledge. Takasago is the name of a city, but also the name of the Noh play about two pine trees that are intertwined, representing a long marital relationship. The autumn season reminded me of the lines from a song that says the people who love autumn are people with deep hearts like the lover of the singer. According to resources online, in Chinese decorative art, the pomegranate represents keeping "the title or rank from generation to generation in the same family," while pine trees represent longevity, steadfastness and self-discipline. "The peony symbolizes beauty, rank, higher social status, luxury and opulence.” But the whole movie requires better cultural literacy. “The Assassin” is actually about one particularly famous assassin, and the original title is “Assassin Nie Yinniang.” Nie is not a common Chinese surname, but it is one listed in the “Hundred Family Surnames” ( 百家姓); it means whispers, and is represented as the symbol for three ears. Yinniang literally means “secret daughter,” and Nie Yinniang is the character of a famous Tang Dynasty short story that has since been told and retold and exists in many variations. The Tang Dynasty (618-907) was the golden age of Chinese culture, when the capital Chang’an (now Xi’an) was the most populous city in the world and impressed the Japanese so much that Kyoto was based on that city’s layout. Historically, it helps to know that the Imperial court was unsuccessful in its attempts to quell rebellion from Weibo. According to “Women and Gender in Contemporary Chinese Societies: Beyond Han Patriarchy,” in Tang Dynasty legends, two women martial arts masters—Nie Yinniang and Hong Fu Nu—stand out. Nie Yinniang was trained by a nun beginning at age ten in “The Biography of Nie Yinniang.” More importantly, she “selected a man who made mirrors as her husband” even though traditionally it was the right of the father “to arrange a marriage to serve his political interests.” The Confucian three obediences for women (to father, to husband and then during widowhood to son) are not applied to Nie Yinniang. From my studies in Japanese culture, I wasn’t surprised that a nun was the political power behind the assassin. Masako Hojo (1156-1225), the wife of the first Kamakura period shogun, Yoritomo Minamoto (1147-1199), ruled Japan after his death, although she was a cloistered nun and is often known as the “nun shogun.” In “The Assassin,” however, we have a former princess who is passing judgment and using her pupil as an executioner. While in China there is a tradition of monks trained in martial arts according to “Beyond Han Patriarchy” there are “legendary accounts of the Daoist nun masters of E Mei Mountain.” Yet at the time of Yinniang, the writer’s choice to make her master and martial arts instructor a nun, instead of a male teacher “at a time when most educators in ancient China were male,” was also meant to make this story exceptional or less ordinary. Besides the references to a famous story, there are other cultural things, aspects of language, that might explain relationships in the original Chinese dialogue that are not so easy to translate because the word “uncle” and “aunt” have so many different translations in Chinese as to be dizzying to non-native Chinese speakers. 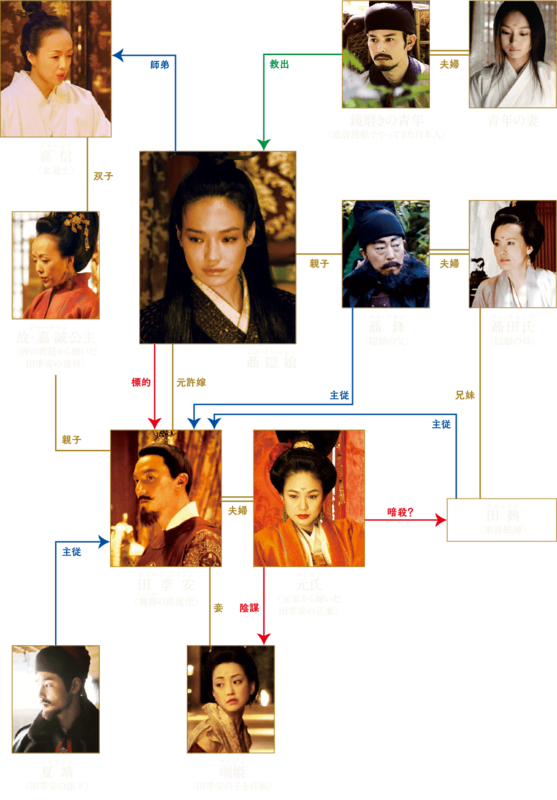 The film is re-titled “Kokui no Shikyaku” in Japanese, which translates as “Black-robed Assassin.” From the official Japanese website, I pulled a diagram of all the relationships in the movie which may be helpful for those who see the film. The brown lines show family relationships or ties. The blue lines indicate master-servant relationships. The red lines indicate who either ordered, or was ordered, to kill someone. Next Article: Life-Affirming: BBC/PBS' "Big Blue Live" Previous Article: "The Look of Silence"